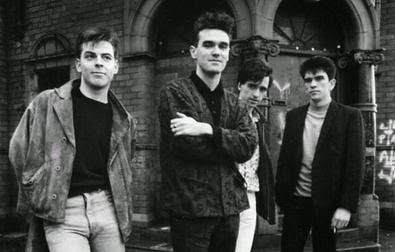 The Smiths (image credit) is one of those band that by all that is right I should love - and I don't. I find them OK, but there is only one song that scores higher in my appreciation than those two letters. Their third and best album The Queen is dead from 1986 includes one of the most touching and romantic songs of the eighties: There is a light that never goes out. Morrissey's lyrics are so morbid it hurts: "And if a double-decker bus crashes in to us, to die by your side is such a heavenly way to die - and if a ten ton truck kills the both of us, to die by your side, well the pleasure, the privilege is mine...."